What is the Bolton Care Record? Things are changing in Bolton. As part of planned improvements, local health and social care organisations will be working more closely together to make patient care even better. To do this, we need to make some changes so that everyone directly involved in your care can see your medical records. This means that your GP, a specialist at the hospital, a district nurse or your social care professional, will have access to the information they need. The Bolton Care Record is a new confidential computer record that will provide health and social care professionals, directly involved in your care, access to the most up-to-date information about you. It does this by securely sharing appropriate information from your medical and care records between health and social care services in Bolton. Address and telephone number – so we have one set of contact details. Joined up care is safer care. More time spent on you and your care, instead of going over the same information. Better self management for patients. 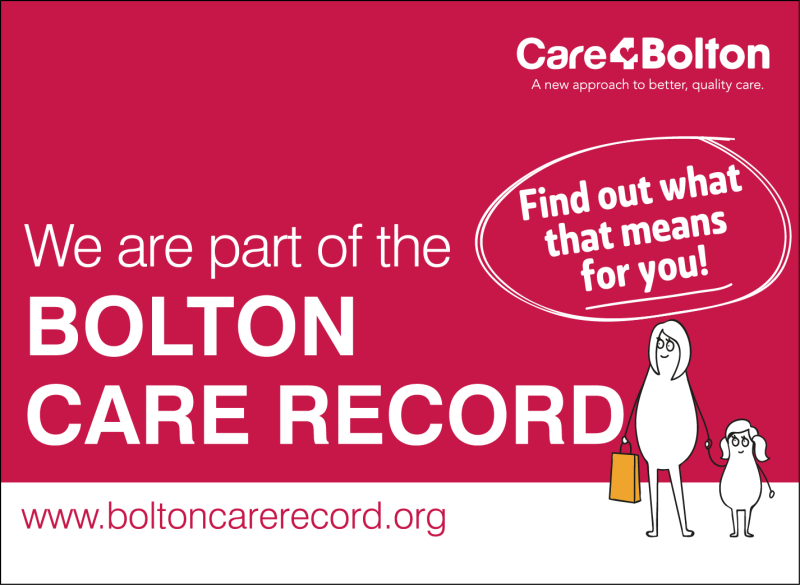 http://www.boltoncarerecord.org to get involved with the conversation and have your opinion heard.